It is not a mixture of ion exchangers or adsorbents, but a unique macro-porous synthetic polymer that removes soluble and insoluble impurities from water at a rate and capacity that exceeds all others by over 500%. Purigen® controls ammonia, nitrites and nitrates by removing nitrogenous organic waste that would otherwise release these harmful compounds. Purigen's™ impact on trace elements is minimal. It significantly raises redox. It polishes water to unparalleled clarity. Purigen® darkens progressively as it exhausts, and is easily renewed by treating with bleach. 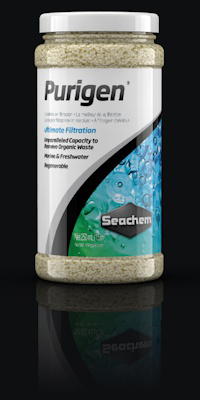 Purigen® is designed for both marine and freshwater use. Capacity: Purigen's™ possesses enhanced capacity owing to its vast surface area. All other resins on the market are purely spherical extruded beads. These beads remain smooth even under a microscope. Purigen® is both spherical and macroreticular. It has microscopic pores that increase its usable surface area to many times that of a purely spherical resin. Regeneration: Purigen® can also be regenerated. As it adsorbs waste products, Purigen® will change colour from a pale blonde to a dark brown, almost black. Once it is exhausted, it can be regenerated with a solution of bleach and water. The bleach will literally "burn off" the organics that have been removed from the tank. Watch out for products that claim to be regenerable with a brine solution. That is the regeneration procedure for ion-exchange purposes. A brine solution will not remove organics. While such resins have a limited capacity for organic adsorption, a brine regeneration process only replaces removed ionic compounds. It does not destroy large organic molecules that were removed, which is the primary function of organic adsorption resins. 250mls of Purigen will successfully treat up to 1000L of aquarium water. Suitable for use in extra fine mesh bags in filters, sumps and fluid reactors.